Today instead of one wheel for Nail Wheel Wednesday, I have a whole bunch. Chester had asked me about how I organize my wheels, and I thought other people might like to know, too, so I'm turning my e-mail to her into this entry. Right now my Helmers are separated into swatched and unswatched drawers, and the unswatched ones are sorted by color and finish (purple shimmers, red cremes, glitter, crack, and so on). At the moment I also have some overflow boxes, but I'm pretending I don't so let's not talk any more about those. When I'm deciding which colors to put on a new wheel, I pull out an unswatched drawer and just sort the bottles into groups that look like they go together. Sometimes I get fooled and end up with situations like a dark purple on a red wheel or a subtle shimmer on a creme wheel, which bothers the OCD side of me but which I figure I just have to live with for now because if I stop to re-do wheels that have problems I will never ever finish this swatching project. And I must finish the swatching project so I can get my Helmers back sorted by brand so I can find things and not be distressed by the jumble of all those different bottles crammed in together. I try to paint lighter colors first, moving to dark ones as I go around the wheel, because I like the way it looks and in theory should mean similar colors end up near each other which is good for comparison purposes. Sometimes I get fooled by the bottles here, too. Doing test swatches on paper first would probably help, but that would take so much time and as alluded to above, I'm impatient to finish these wheels. When it comes to glitters, I put them on wheels by brand/collection rather than color because so often glitters are more than one color and it seemed easier to just let them be with their brandmates. When I did my first wheel, I labeled it A, because I'd numbered each nail tip and liked the idea that I could combine the wheel's letter with the tip's number to get a code to put on my spreadsheet so I could find the swatch of that color from there. Of course, once I got past 26 wheels, this coding system didn't work so well, and thus I had to add a number after the letter for the wheel designation (A2, B2, etc.) As I paint the wheels, I write down which polishes are on them in a little notebook, so I can grab a wheel, see a color I want, and look in the notebook to see what it is. When I first started painting wheels, I stored them in a plastic tackle box I had on hand, but that wasn't ideal because the wheels had to lay on top of each other, so I couldn't see them at a glance. Now I store them in little wooden crates that we get at the grocery store when we buy clementines. They're just the right size for two rows of wheels to fit side by side, and I can them and flip through them easily. Cremes go in one box, shimmers in another, and glitters and everything else in a third. This may seem like a whole lot of record keeping and nonsense to some of you, but this sort of thing deeply appeals to the part of me that led me to get an accounting degree. I like to keep track, make lists, do spreadsheets. I like it even more now that I don't do it for a living (though writing software does use those same logical parts of my brain still). That top picture is amazing! It would make great wallpaper for the computer! Niceeee! :-) I do it almost the same way as you. Instead of naming a wheel "A" I name it 1. OMG, the top picture is to die for! 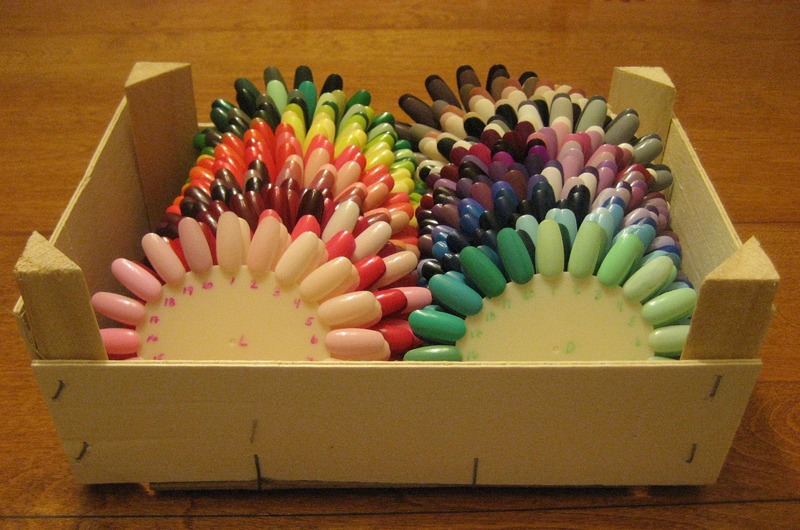 I have a polish spreadsheet, too :-) since 2000, when I swatched my few polishes on fake nails and numbered them in progressive order. Now I group wheels by color without detailing too much, but on spreadsheet I recently added capacity and price (just in case I want to do some statistics)! So what you described in your post is perfectly rational to me! BTW I have an accounting degree, too and I love spreadsheets and lists (before discovering aNobii I kept a spreadsheet to record books I read)! Am I weird to want to jump in and play around with them? That is so wild! Beautiful in that artful way! If no believes you when you say I Love Polish! Just show them your wheels! Thx for sharing...can the accountant in you come over to my house and organize my stash? Ummm, how bout Bruce and I come over and he will entertain you while I play with all your color wheels? lol I absolutely loooove looking at all your wheels and am amazed by your system. I could kick myself for trying to go with swatchsicles instead of wheels. Where you you get your wheels? Fascinating. Thanks for sharing. I like glimpses behind the scene. How far along are you on this project? And I really hope you don't mind, but I am using that first pic as my background right now! i'm a bit OC when it comes to swatches and nail wheels as well, but i bought nail fans for that purpose. that makes it kind of easier.. at least changes are made quite quickly.. even tough i still have the problem, which colours to put on a fan as it can hold up 50 polishes. Love that first photo! So many awesome nail wheels! This might sound stupid, but what's a Helmer? I'm sorry I didn't reply to your email yet. I'm horrible at things like that. mrsrexy, I would love to come organize your stash. :) Too bad it's so far away from me! 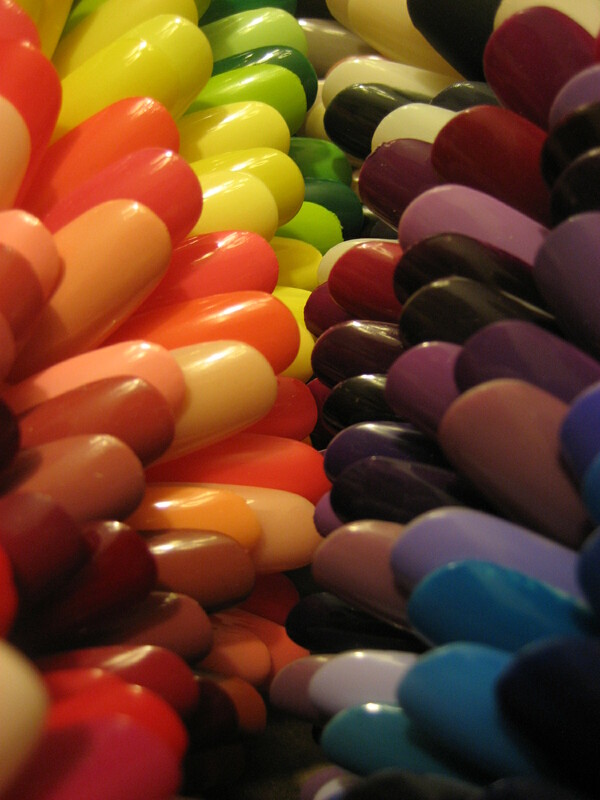 Johanna, I order my wheels in packs of 10 from Transdesign--the have them in the nail art display section. I've seen similar ones on Born Pretty and eBay, too. I like these because they're sturdy; I've never had a tip snap off even though I sometimes carry a few wheels around in my bag to compare to stuff when I'm shopping. purplegreenpanda, I'm closing in on 3/4 of the way done. It would go a lot faster if I weren't always buying new things, of course. let's polish some nails, how many polishes do I have? Let's just say thousands, because the exact number is a bit scary to think about. Danish, a Helmer is a small cabinet from IKEA with six drawers that a lot of ladies like for storing polish. Sorry, I forgot not everyone has heard of them. Chester, no worries and thanks for the idea to do this entry! So many nail wheels. Beautiful picture.